"Breeze on Inn" to this gorgeous one-bedroom unit located on the Sound. This Sound front condo offers an incredible sunset view from your private, enclosed balcony on the 3rd floor. Easy to find elevators make accessing this unit a breeze. This condo has a fully equipped kitchen for all of your cooking needs. Boasting over 900 sq ft of living space, as well as a washer and dryer in the unit, 2-310 comfortably sleeps 4 people with, a Queen bed in the Master bedroom and a comfortable Murphy Bed complete an standard Queen sized mattress. 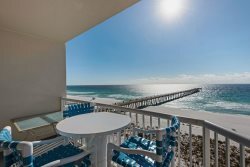 Sunset Harbor Palms on Navarre Beach gives you access to a community only fishing pier, gazebo, swimming pool, and a centrally located elevator in each building for your convenience. This complex is perfect for small families on a budget or the guest looking to spend time on the quiet end of the beach.